The Santa season is now well and truly into its stride. 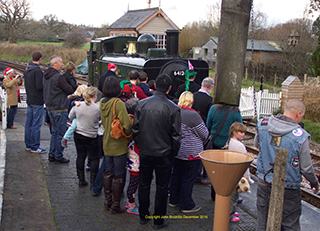 Today – Saturday 18th December – is the first of 8 (yes, eight) days of continuous Santa trains on which the volunteer effort is tremendous. The preparation work took place quite some time ago, to get the train decorated and the grotto built. It needs very regular cleaning, of course. On the train are teams of people serving passengers with mince pies, mulled wine, biscuits and soft drinks, all prepared in the kitchen car, with the buffet car open as well. Santa’s support team makes sure that passengers all get to Santa in his grotto in turn, and that every child gets the right present. The railway is running trains – obviously – so all the usual operating staff are needed, on the platforms, in the signal boxes, on the train and so on. Pete Small has just been in touch with some news about his owls. He apologises profusely that he cannot bring the owls out to the platform at Totnes when the Santa trains arrive because of the current outbreak of bird flu, which means that everything feathered at the Rare Breeds Farm is on complete lockdown, and confined to barracks. Let’s hope that this doesn’t last too long. 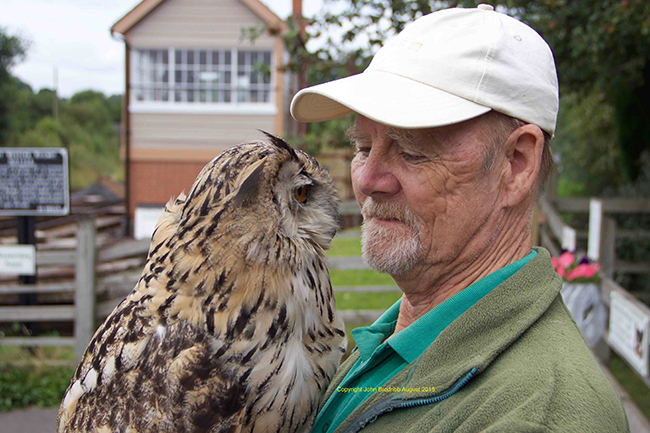 The photo shows Pete with Merlin last August at Totnes. 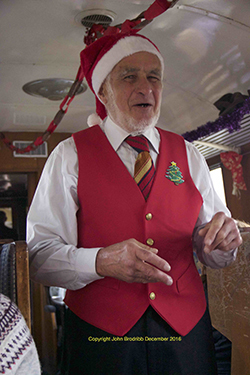 On a brighter note, the South Devon Railway ran a very successful Christmas dining train last Wednesday. One of the passengers on board was Mrs Perring - Nick's mum, for whom it was a birthday treat. 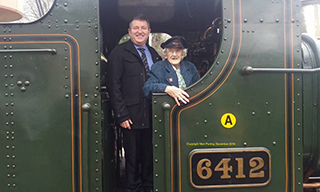 The photos show her on the footplate with Nick Perring, who is in charge of the SDR’s S&T Dept., and is also a driver. 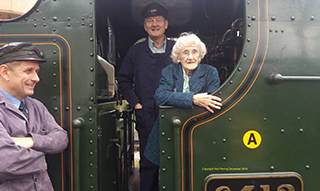 She was also entertained by driver Rodney Cox, with trainee Richard Hoskin on the footplate. 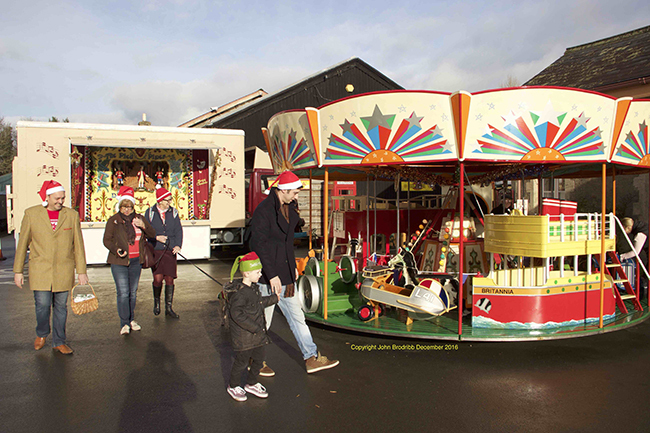 The photos show the fairground at Buckfastleigh, entertaining passengers before and after their journey, and just a few of the scenes on the train, including the grotto. Ted Parrott marshals the visits to Santa. 6412 is seen running round its train at Totnes, and the late turn driver, Allan Cash, showed real dedication in driving on his birthday, although the early turn crew do have to be on at 4.00am. Allan did get a mince pie with a candle, though. 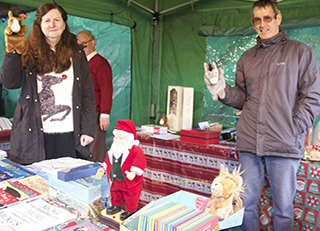 Also at Totnes Rosemary Jessop and Paul Hope staffed the sales stand, which was very popular. Apologies to all those volunteer staff who haven't had a mention by name, but in any case I can’ name the Chief Guardian of the Grotto as he had to be bribed with Chocolate Fingers to let me in there. 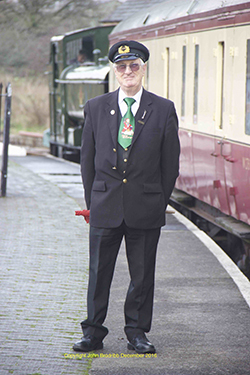 And finally, the featured Regular Volunteer Guard, in charge of Santa’s train, was Colin Rogers, wearing the new SDR standard issue Santa train tie. The railway owes a huge vote of thanks to all the volunteers involved in the very successful Santa operation.